Home » The Law & You » The Insurance Company Wants a Statement After Slip and Fall Accident. What Do I Do? The Insurance Company Wants a Statement After Slip and Fall Accident. What Do I Do? A viewer slipped and fall on the wet tile at a restaurant. The restaurant’s insurance company is looking for a statement. What should she do? It’s premises liability attorneys Greg Fellerman and Ed Ciarimiboli to the rescue. 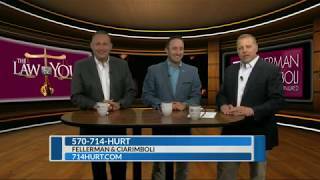 Dave Kuharchik: It is time once again for “The Law & You,” featuring the area’s only virtual law center right here on Eyewitness News with attorneys Greg Fellerman and Ed Ciarimboli. Fellas, great to see you guys. Ed Ciarimboli: It makes us look skinny. Greg Fellerman: I need a little help with that. Dave: The energy is flowing in the virtual law center and today we are talking slip and fall. Here’s our question: Sydney from Albrightsville says, “I slipped and fell on a wet tile in a local restaurant. There were no signs up and it was just mopped. I broke my hip and wrist.” So what’s the deal here? “I just heard from the restaurant’s insurance company looking for a statement.” So what should Sydney do? Ed: Obviously, Sydney, you shouldn’t talk to the insurance company. You really should contact a lawyer. Talk to the lawyer first. There’s a lot going on with this particular type of case. It’s a simple fall case. Obviously, you have some significant injuries but you want to get in and do an inspection. Make sure the tile was an appropriate type of tile to be used for a floor. Believe it or not, we’ve had cases that the wrong tile has been put on the floor, it increases what’s called the coeffiction of friction. It makes it really, really slippery. There are a number of things you want to make sure you’re going to do to protect yourself. One of them is getting to a lawyer immediately. Greg: The good part of the case is, it sounds like they create the danger, they mop the floor, they didn’t put the right signs up. So that’s the stuff I like about the case. Obviously, we want to look for surveillance video, any witness statements, all that stuff puts your case together. It sounds like it would be a good case but I agree with Ed, you definitely need to reach out to a lawyer ASAP. Dave: Coeffiction of friction, wow. The big terms are coming out tonight. Ed: It just means slippery. Dave: These guys, don’t they carry with the big terms? They will make them very clear to you and help you with your legal case. You can call them, check them out online. And don’t forget results matter. Attorneys Greg Fellerman and Ed Ciarimboli, we’ll see you next time.